So, I am a gym rat and a beauty rat and sometimes these two do not mix. I go to the gym in the middle of the day and I get super sweaty so I have to shower. I like to carry a little beauty box with me in my gym bag so I can bring myself back to my normal self as much as I can after I work it out! First up, I have my shower and after shower crew. My ECRU shampoo and conditioner set was original when I started out but, now they have morphed into refills. They are currently filled with Pacifica Shampoo and Conditioner. You can check out all the details in the link above. I also rotate out my body wash from the Soap Not Radio container. It is currently filled with Sauve bodywash. 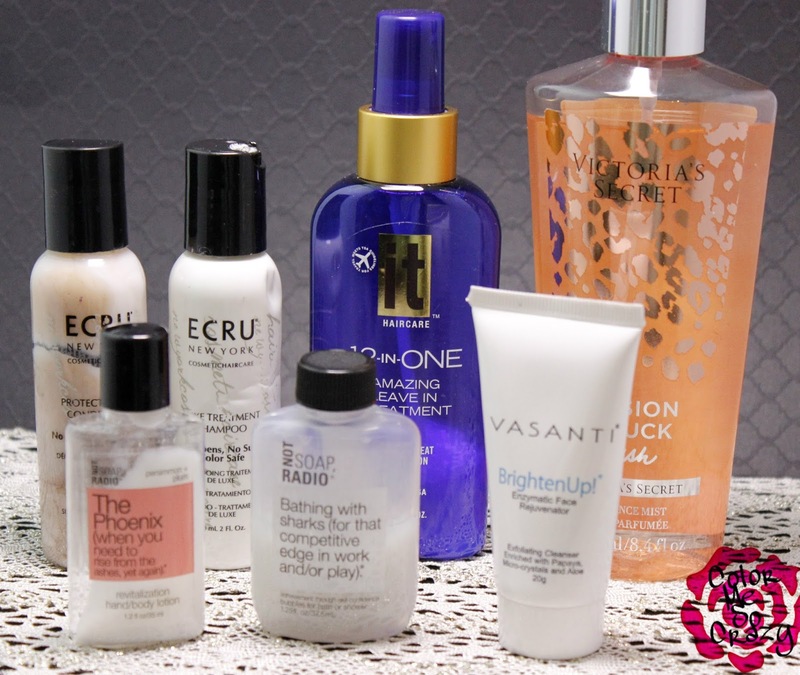 I am currently using Vasanti as my face wash, which I rotate with my CeraVe face wash (not pictured because I left it in my locker). For my leave- in- conditioner, I use the 12-in-One from IT Haircare. It takes care of everything I need and leaves my hair feeling awesome. **HINT HINT** I have a review post of this coming up next week which includes a nice little giveaway!! 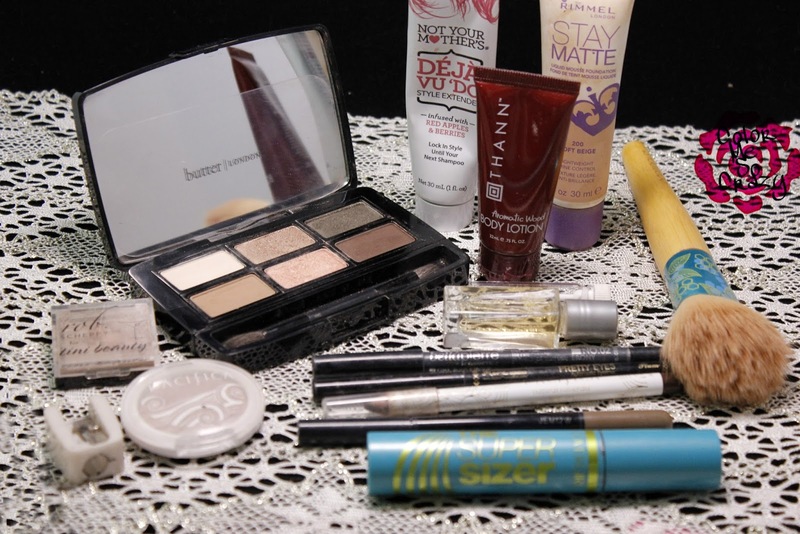 These are products that I have in my bag but don't necessarily use every day. My Suave deodorant, I use everyday, but everything else is in there "just in case" I don't have time to shower and I need a quick wipe down. I have Pacifica make-up wipes (doubles as a quick body wipe), refreshing herbal mist from NeoCell that is a nice cooling spray, SweetSpot Labs freshening wipes, Blistex and Colgate wisp disposable toothbrush. Now, this is the stash. 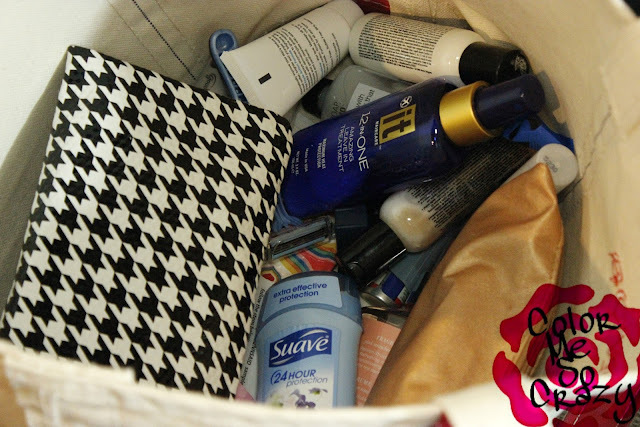 I have a quick little makeup bag that has all the essentials. I add things to it and take things out often and depending on the season but this is the basic essentials. I keep all of this stuff in two Ipsy bags- which make perfect storage (especially the vinyl ones). An addition to my hair after I dry it is Not Your Mother's Style Extender. 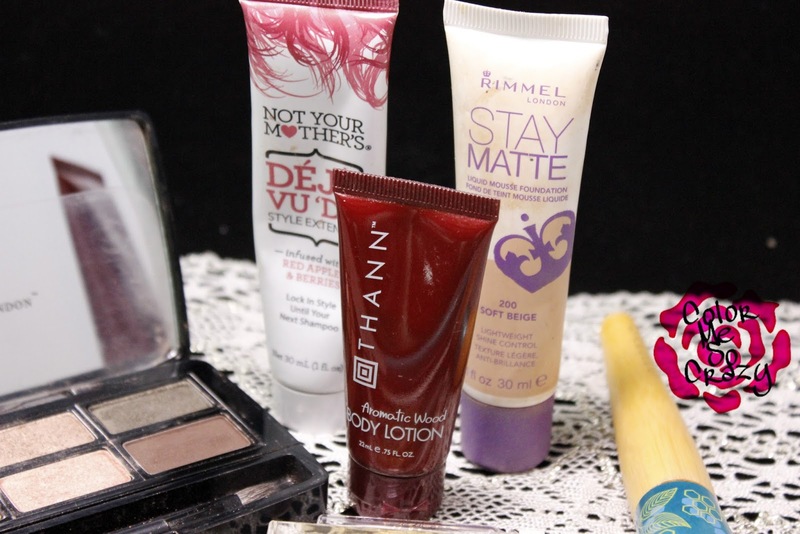 I also have a random body lotion (from some hotel) and my favorite drugstore foundation>> Rimmel Stay Matte in Soft Beige. 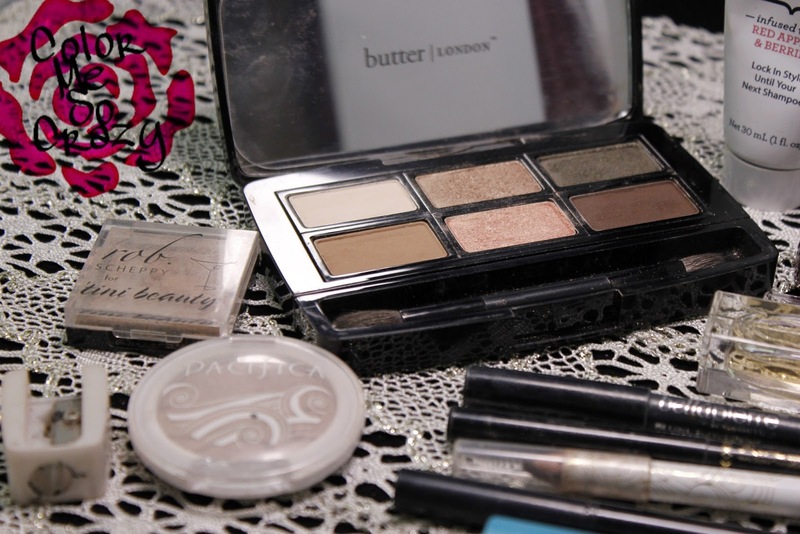 I have a little butter LONDON palette, Rob Scheppy shadow in Pearl Fizz, and Pacifica shadow in Ethereal.I also had to throw a sharpener in there because I kept forgetting to bring my pencils home to sharpen them and it's just easier to do it there. 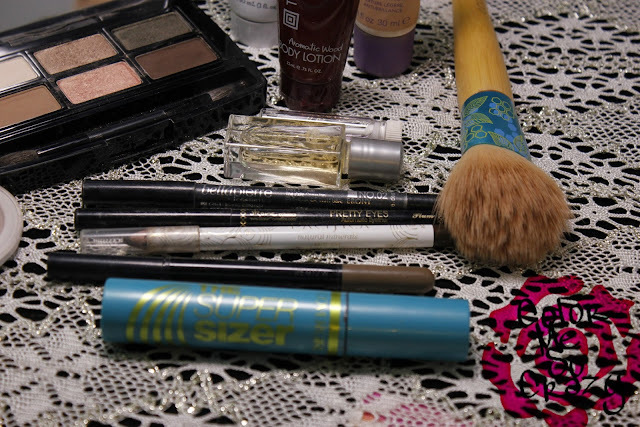 For the eyes, I have SuperSizer from Covergirl mascara, liners from Pacifica, Bellapierra, Skone, and a Maybelline eyebrow pencil. I also have Escada Joyful and Pure Vanilla from Lavanila for a little scent. I do have an Ecotools brush to blend all that goodness in. Now, I have struggled with putting a blush in this bag, but I usually use a shade from my butter LONDON palette or the Pacifica shadow to do some highlighted cheeks. That's about it. 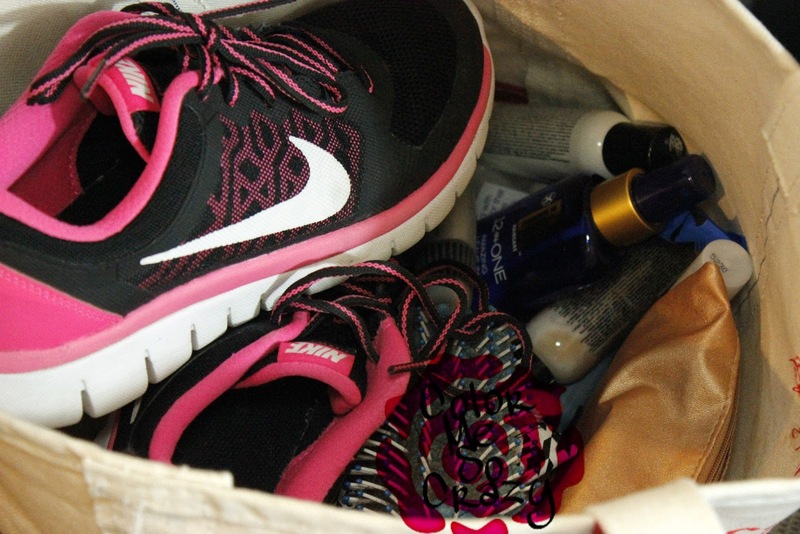 Do you have a makeup bag in your gym bag? What kinds of things do you have in it? 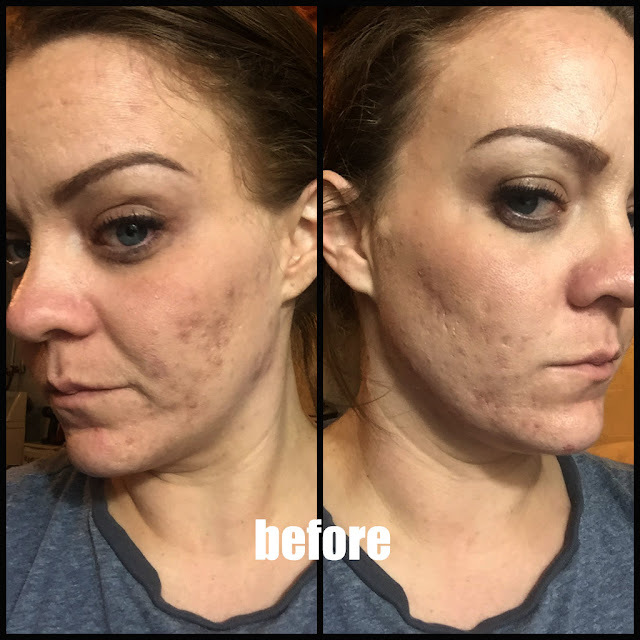 I would love to know what's different than mine so I can add to mine! Share yours below!